The first people to cross over into North America from Asia are referred to as the Clovis People. 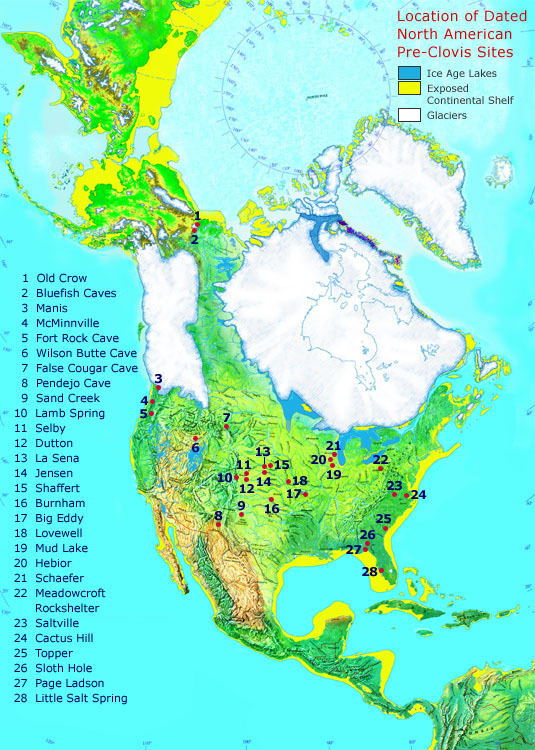 Below, are sites in North America where their artifacts have been found. The contents of this page are borrowed from "PBS.ORG" and from the NOVA program. Large mammal bones, possibly flaked or cut. Mammoth bone core and flakes, microblades, and debitage. Antler point in mastodon rib. Mastodon bone cut and flaked. Broken mammoth bones and bison tibia chopper. Stemmed points found in early context. Stone artifacts and human hair. Human hair and prints in baked clay, and possible stone tools. Mammoth associated with a stone tool. Flaked and polished extinct mammal bones. Flake tools associated with extinct fauna. Mammoth bones with butchering marks. Stone tools and mammoth bones with butchering marks. Lanceolate point, blade-like flakes, and charred basketry. Flaked stone, fractured and polished bone. Lanceolate points, blades, and blade cores. Possible stone tools found in dated deposits. Stone tools and cut mastodon tusks. Shaped wooden stake embedded in extinct tortoise shell. Even faced with evidence to the contrary, Clovis First supporters refused to accept that people could have arrived in America earlier than 13,500 years ago. When Wallace and his team analyzed the mitochondrial DNA of Native Americans, they found four distinctive lineages that he labeled A, B, C and D. All four turned out to share common ancestors back in Siberia and northeast Asia. So far, these findings were consistent with the Clovis First theory that the first Americans came from Asia. But when Wallace calculated how long ago the Asian and Native American DNA diverged, he was shocked. He repeated his work, as did other labs. The results were consistent. Three of the four main ancestral groups A, C and D, diverged from their Asian forbears at least 20,000 years ago. And even more striking, the first Americans didn't all come at once, but in at least three waves of migration. The Clovis spear point is a single stone, bifacial, or shaped on both sides, with a flute, or groove, at its base. The spear points in Asia are made from lots of small razor-like flints called micro-blades embedded in a bone handle. Now there was a real puzzle. The DNA says the earliest Americans are from Asia, yet the Clovis point, is nowhere to be found in Asia. One day, while making a Clovis point, he had a moment of inspiration. He remembered a popular science book he had seen when he was a student. It showed pictures of ancient spearheads made by the Solutreans, people who lived in Ice Age France and Spain. Their spear points resembled Clovis points. It seemed unbelievable, but Stanford and Bradley posed the question, "Could the Clovis point and some of the earliest Americans be from Europe?" NARRATOR: To connect the Solutreans and Clovis, he needed to find out if they produced their spearheads using the same big flake technique. BRUCE BRADLEY: So what we do is we go back to the collections of the broken materials, which is probably 99 percent of what there is here, and in that we're seeing the various ways that the Solutreans were making the things, not just the finished objects. And so it's the pieces that are hidden away that are going to tell us the most. NARRATOR: And there in the drawers were big flakes, a clear sign that the Solutreans had made their spearheads in an identical technique to that of Clovis. "Clovis" was the name given to this era because it was around Clovis, New Mexico that artifacts of this era were first found. The Clovis era dates approximately 13,500 years ago. Clovis artifacts were found in "Cactus Hill" Virginia. Excavating below this level, Pre-Clovis artifacts such as a number of arrow points, blades, scrappers, and tool were found. This era is dated about 5,000 years before the Clovis era, or about 18,000 years ago. This site is now closed and filled in. Other Pre-Clovis sites have been found in Meadowcroft Rockshelter, Pennsylvania, and other locations. A newer theory is that the people crossing over into what is now North America, perhaps followed the western, warmer coastline in boats.